Strengthen your plant’s infrastructure with Tech4’s products including Control Panel Assembly, Component Sales, and Turnkey Solutions. 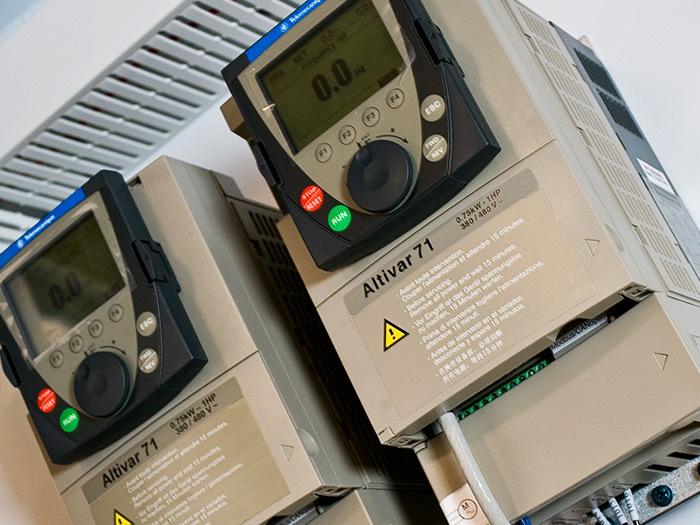 Increase efficiency with a custom designed control panel or secure your plant’s operations with modern parts and support from our component sales department. We enjoy everything we do, but we especially love doing the turnkey solution. It’s a creative paradise where we’re able to give our imaginations free reign over the process, and we’re able to provide many exciting and unprecedented process advantages fro our clients. We love starting from scratch with nothing but our clients’ raw idea and our brainpower at hand. Our engineers brainstorm, throw out ideas, drink coffee, brainstorm some more, drink more coffee, and a few pots later we’re on a roll. Soon the idea takes shape and our clients are there sharing their ideas while the process moves from a mere idea to a working reality. It’s a lot of fun and it sets us apart. We can do everything and our clients know what they can expect and that they can get quality results at a fair price. We’re very competitive that way, it must be our Midwestern work ethic. One of our most popular products is out turnkey solution. This is ideal for clients who need the most cost-effective and seamless solution possible. Starting with the design and wrapping it up with follow-up support, the turnkey solution ensures that every part of the process, from the control systems to the equipment, is homogenous and operates as expected. Our Engineers work with you and your staff to determine exactly what you want and need, then create the best solution from your specifications. For the most efficient processes, the turnkey solution is the best choice. We specially design and assemble control panels based on our clients’ needs and input. In our fully-equipped and modern facility, our highly skilled electronic technicians design and build control panels all day, every day. In our turnkey solution, our control panel assembly fits seamlessly into the application where we can ensure that everything works easily together as they should. If you have an existing panel design, you’ll be pleased to know that we also build-to drawing. We take great pride in our workmanship, and the Tech4 quality is always evident in our clean and easily accessible wiring, routing and organizing labeling. Find the part you need and knowledgeable application assistance with Tech4’s component sales. When you’re in downtime or turnaround, there’s no time for delays when finding a specific part. Our engineers are always on call to help you find the part you need and get it to you ASAP. Sometimes there are better parts on the market, and our years of applications experience give us the knowledge to help integrate a new part into your existing application. We only recommend products we’ve worked with so we know their capabilities and which parts work best with specific application uses. We also provide documentation, support, and capability assistance with the part at the same cost you would pay elsewhere for just the part alone. If you need equipment built from pre-approved parts, give us the list of hardware to use and we’ll assemble the application and try to make it faster and better. To minimize downtime, clients often have us create custom solutions form scratch that will make the automation as successful as possible.